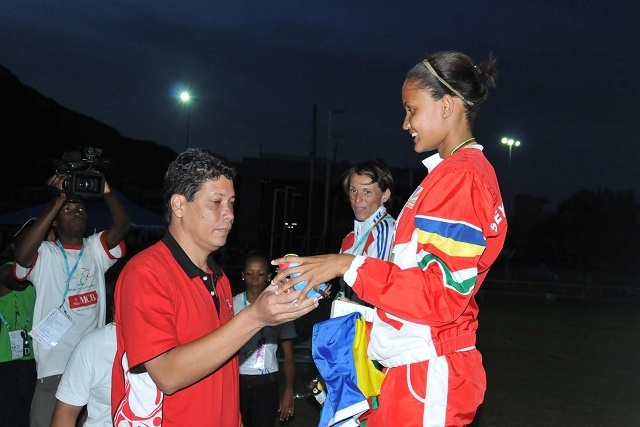 (Seychelles News Agency) - After winning a gold medal in high jump in the 11th edition of the All-Africa Games in Congo Brazzaville, Seychelles female high jumper Lissa Labiche has her eyes set on a qualification spot for the Olympic Games in Rio de Janeiro, Brazil in 2016. At the recent competition last month, Labiche came out first with a height of 1.91 metres, only 3 centimetres below the qualifying height, which is 1.94 metres. The young high jump specialist's efforts to attempt this height was to no avail during the final in Brazzaville. Currently, 1.92 metres is the island nation's national record set by Labiche during the South African Open Athletics Championship in May. The 22 year-old is presently living with her family at Ma Joie, a village in the north eastern part of Mahe, Seychelles main and most populated island. That is of course when she is not travelling. 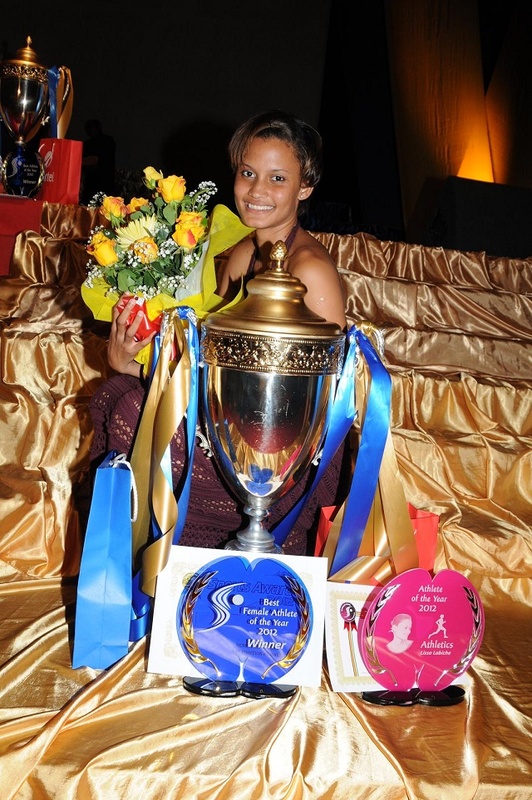 SNA met with Labiche now that she is resting after a hectic season in 2015. SNA: Your last competition was at the All-Africa Games, how would you describe your performance? LL: The medal I won at the All-Africa Games represents a big achievement for me this year and its due to my hard work and efforts. I was satisfied with my result and it's something I will never forget. Since in 2011, at the 10th All-Africa Games in Maputo, Mozambique I only won the bronze medal, going from bronze to gold for me is a big achievement. SNA: How was the level of competition in that event? LL: Well, the competition was tough and it was not easy not knowing what other athletes were coming with, nevertheless I was able to give my best. SNA: You were attempting 1.94m to qualify for the 2016 Olympic Games, which did not happen, do you still you can make it before the games? LL: I tried but did not make it, but I still believe I have the possibility of making it next year. SNA: Have you been able to jump 1.94m before? LL: I have not managed that height during training but at high level competitions I have tried many times and I see the possibility of my achieving it. SNA: Any major competitions coming up soon? LL: For the time being the 2015 season is over and its only next year that I will be going back to competing. Our season is not long like other sports. All-Africa Games was our last major competition and next year we will have the Olympic Games. SNA: What do you do during off season? LL: Now we only do pre-season preparation doing endurance and weight training. It is hard training which we do before the season starts. Now that the season has ended, Labiche is spending more time with her family especially her almost 2 years old daughter Lerysa. SNA: How do you manage being a high level athlete with being a mum? LL: Well, at first it was difficult to get back at it because I did not want to travel and leave my baby behind but then I said why not, so I went to the Commonwealth Games in Glasgow. I tried my best but did not achieve a good result I could only jump 1.71 metres. The Glasgow, Scotland Commonwealth Games took place from July 23 to August 3, 2014 and it was considered as one of the most successful edition of the games, with the participation of participation of 17 nations and territories including Seychelles, competing in 17 sporting events over a period of 11 days. This year I saw that I have improved a lot, I managed to clear the bar at 1.92 metres which is my best performance for this year, so I am satisfied. SNA: Talking about family, what happens to your daughter when you need to travel? LL: She stays with my mum and my partner when she is not attending day care. SNA: If you were to describe your sporting career since you started at 14 years up till now, what would you say has been your greatest moment? LL: My greatest moment was when I won a silver medal at the World Championship in Barcelona. Labiche participated in the 14th edition of World Junior Athletics championship held in Barcelona, Spain from July 10 to 15, 2012. I did not expect to be among the top three performers. I knew I was in great form, but I still thought I would finish 4th or 5th. When I jumped I suddenly saw myself in second place. I was so overjoyed and emotional being an athlete from a small country like Seychelles to reach that height; it made me so happy. SNA: What about the most difficult moment in your career? LL: I was discouraged when I just had my baby [in 2014]. A lot of people were saying I would not be able to go back to the level I was performing before. Well, I proved them wrong. Got back in training and although last year I did not obtain very good results I simply worked harder and this year I got the results. SNA: Being in the world of high jump is there any one that has inspired you? LL: My biggest inspiration is Blanka Vlasic she has won gold at the Olympics and world championship. I met her at the World Championship this year and this was a great moment for me to meet her in person since I did not see her in 2012 as she was nursing an injury. To meet all the professionals at the event was an honour. Vlasic comes from Croatia and she is a high jump specialist who attended her first Olympic at 16 years old and that was in Sydney, Australia. She won her first gold medal in 2000 at the World Junior Championships in Athletics. She is the second in high jump ranking behind Stefka Kostadinova, high jump world record holder from Bulgaria. SNA: To perform as an individual athlete requires a lot of support so how is that working out for you? 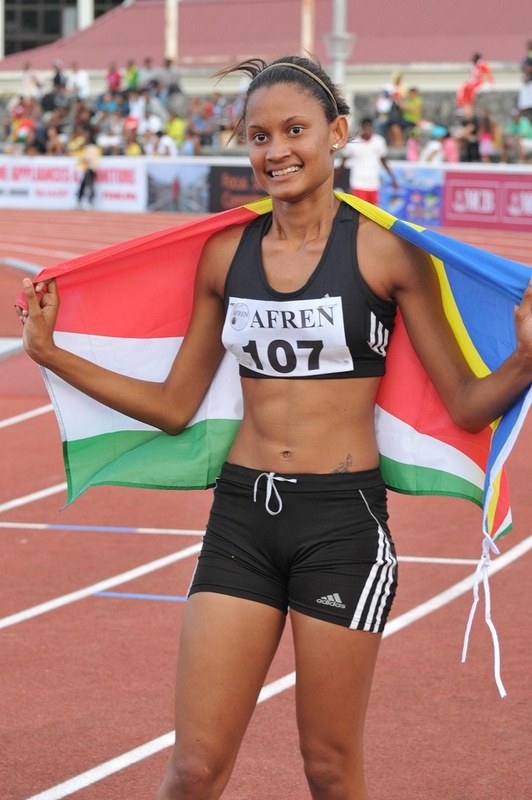 LL: The Seychelles Athletics Federation and the National Sports Council do provide me with some support but since I am working more as a professional athlete I need a bit more incentives. It is not easy doing sports full time especially having a child. I am not employed I am doing sports full time and taking athletics as a career but I am not getting necessary financial support to do that. This may be the reason why some athletes are discouraged. It is not a matter of being after the money but I love my sport and I would like to do it professionally. Right now I am devoting all of my time in sports and I have little time for other leisure activities. When I am not performing I have to rest; training is tough and there is also constant travelling. SNA: Talking about training how does that take place and how often? LL: This year my training has been difficult because the competitions were taking place one after the other. It was training for only a week and the next week I had to compete. So I could not complete all of my training. SNA: Does this have any impact on your result? LL: Well it has had a positive impact because I am getting more exposure and this really improves my performance. SNA: You have performed very well winning a silver medal at the World Junior Championship in Barcelona, gold at the South African open, gold in the Indian Ocean Island Games and another gold at the All Africa Games. What are you aiming for next? LL: I am thinking of going to Europe, but so far the opportunity has presented itself. I have not received any offer yet. If I am offered the opportunity, where I can go with my family [partner and daughter] I will go. For the time being I wish to have my own place to stay but it is difficult with the constant travelling plus my partner is a firemen also working shift so it is not easy for the both of us. So for now my personal plans are secondary because my focus in on my career. Lisa Labiche got into high jump haphazardly. She started practicing the sport at the age of 14 while still a student at Mont Fleuri Secondary school. Basketball was her sport of choice back then but her Physical Education (PE) teacher saw her potential in high jumping. 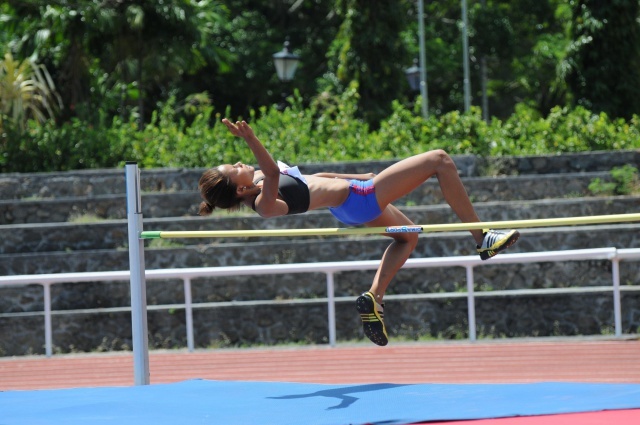 She was registered for the annual Inter School championship and established a new school record with a height of 1.60 metres and the rest as they say is history. Labiche’s PE teacher Joseph Adam [national record holder of 400 metre races since May 1993] who is also a national team trainer for sprints [short distance races like 100,200 and 400 metres] had her joine the team where she trained with Russian high jump specialist Valentina Avilova. When coach Valentina left, Labiche trained with another local trainer Eugene Ernesta [who established a national record for high jump 2.21 in 2000 at the African Championship). For the past 5 years she has been training with Cuban coach Carlos Sanchez. 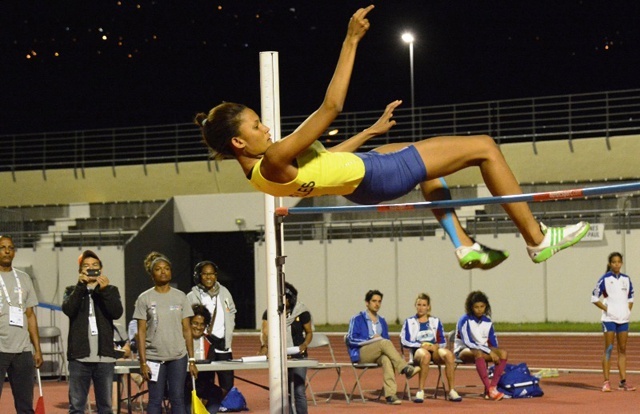 In spite of the challenges she is facing, Labiche is hopeful that she can progress in her discipline and become a fully fledged professional athlete. This is one of her biggest dream while she continues to push herself to become better and make Seychelles proud to have an athlete like her.